Prepare or repair wooden flooring with wood floor fillers. Our range of wooden floor fillers are perfect for all sorts of floor repairs. With these you can; fill gaps between floorboards, fill splits in soft and hardwood flooring and repair small holes, dents and other minor imperfections. To purchase any of these products please call into one of our branches. 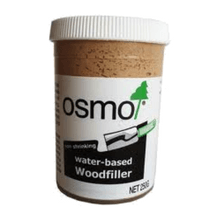 Osmo Woodfiller is a non-acryllic and water-based multi-purpose edge-filler, wood putty, crack filler and sanding sealer all in one. Unlike most woodfillers, it can easily be sanded at any time after drying, and it's fast drying -within approx. 30 minutes. 250g. Will not crack, shrink, sink or fall out. 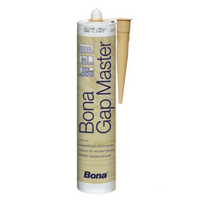 Bona Gap Master is an acrylic based mastic for sealing gaps towards skirting boards and thresholds in connection to wooden floors. It can also be used to repair damages and to fill gaps and cracks in the floor. 310ml. 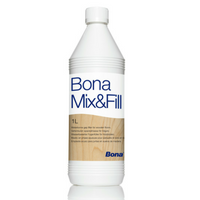 Bona Mix & Fill is functional with practically all types of wood. 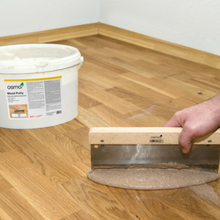 The filler is mixed with wood dust from the actual floor to be treated producing a natural colouration that blends in with the rest of the floor. 1L.